How does that compare to Spotify? We pulled Drake’s lifetime global Spotify chart numbers from streaming data site Kworb (up to and including July 21), across 168 tracks (yes, he’s been that prolific), and combined their total stream counts. Based on these numbers, Drake’s catalog – which includes songs recorded by other artists on which he’s featured – has attracted 13.018bn charting streams to date on Spotify. Regardless, Drake’s 13bn+ chart total comfortably makes him the biggest artist in history on Spotify, ahead of the likes of Ed Sheeran (9.084bn), Justin Bieber (8.696bn) and Kendrick Lamar (4.589bn). So… if Drake’s done over 10bn streams on Apple Music and over 13bn streams on Spotify, how much money has he generated on these services? A good ballpark figure on Spotify is a total industry payout (recorded music plus publishing) of approximately $0.005 per stream, which takes into account the fact that around 56% of the service’s users are on its free tier. On Apple Music, which doesn’t have a free tier, the per-stream payout is naturally higher. Playing it safe, then, assuming an average per-stream payout for Drake (publishing-plus-recorded rights) across both services of $0.005 would seem to be conservative. So… it appears safe to say that Drake’s 23bn+ chart-eligible streams across Apple Music and Spotify alone would have equated to a lifetime total payout in excess of $115m. 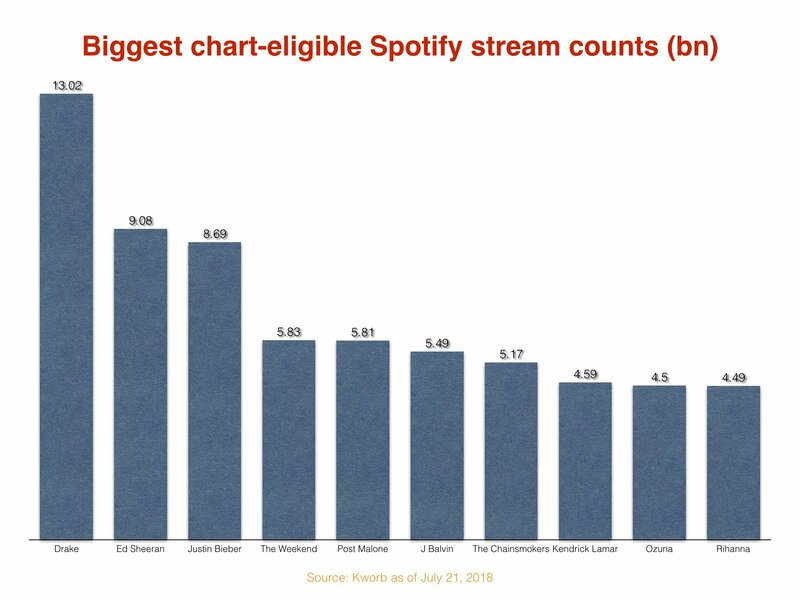 The true figure is likely to be higher, especially if billions of Drake streams, as expected, have not been considered chart-eligible by Spotify. Industry sources suggest his true lifetime global stream count on the service is actually closer to 19bn than 13bn, but this is not publicly verifiable. If that’s true, based on the $0.005 average per-stream metric, Drake would have generated around $145m on Spotify and Apple Music to date. Earlier this year, Spotify revealed it had paid out €8bn in its lifetime to music rights-holders across the world.